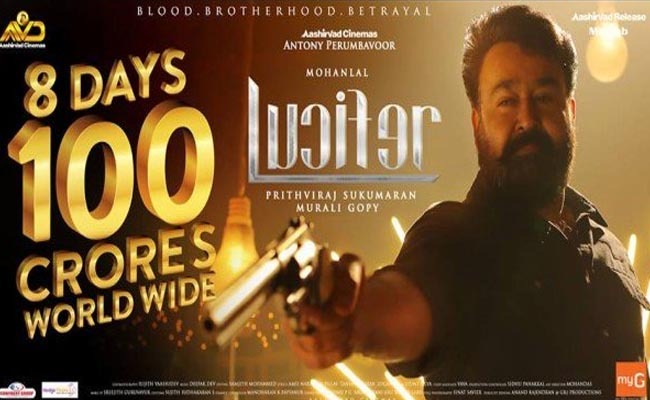 As was expected the latest outing from Superstar Mohanlal – Lucifer has entered the coveted INR 100 Cr club. Well, the interesting thing is that the feat was achieved by the movie in a record breaking box office run of 8 days. The news was informed by ‘Aashirvad Cinemas’, and while announcing the news, the production house expressed their utmost gratitude to the audiences, who have made the movie a roaring success. As was mentioned in their social media post, it was the first time, that the production house officially disclosed the collection of their production venture. Lucifer, which has gone onto become the new industry norm, everywhere it got released, is surely taking Malayalam cinema to the next level. That said, the final box office collection figure of Pulimurugan is sure to bow down before Lucifer. However, the biggest hurdle before Lucifer would be beating the Kerala box office figure of Pulimurugan, which stands tall at over INR 80 Cr, which not even the mighty Baahubali managed to track down.